TRESSA GRAVES is an American novelist, known primarily for her work in the genre of horror and Psychological Thrillers. After achieving success with her novel, 'The Sawgrass Footpath,' gaining further notoriety in modeling, in turn, leading to new projects such as the launching of three new companies,Tressa Graves Productions and Huggies From My Juggies t-shirt line as well as her podcast, The Dark Hours. New writing projects include a book of short stories, 'The Dark Hours Series' and her first true crime story, which is very well researched, as it is her own. There is also an ample backlog of unreleased work to come out in good time. Tressa has enjoyed a significant jump in her celebrity. A two year hiatus was forced on Tressa due to a bad TRESSA GRAVES is an American novelist, known primarily for her work in the genre of horror and Psychological Thrillers. After achieving success with her novel, 'The Sawgrass Footpath,' gaining further notoriety in modeling, in turn, leading to new projects such as the launching of three new companies,Tressa Graves Productions and Huggies From My Juggies t-shirt line as well as her podcast, The Dark Hours. A two year hiatus was forced on Tressa due to a bad stalker situation. The Police and FBI investigation is still ongoing and Tressa has struggled to overcome developed phobias and fears. However, not only has she found the strength to venture back out in public, Tressa has built a significant level of confidence in writing out her experiences in her first non-fiction, true crime story. Tressa never thought her first true crime story would be her own. The title of the book is, 'The Stalking of Tressa Graves The MONSTER of Melbourne' and reliving the experience is something she did not want to do. But, by suggestions of the law enforcement involved, she decided to move forward with it. The officers have said this is the worst case of stalking they've ever seen and suggested the story should be shared with others. Though Tressa enjoys living in east Tennessee and taking weekend drives in the mountains, her heart still yearns for the swamps in her home state of Florida. She is a fanatical fan of Dolly Parton and who was the impetus for Tressa to move to Tennessee. Tressa is also, 'Stephen King's #1 fan' and her collection of his books and movies are the only thing to rival her collection of Dolly's music and memorabilia. Tressa is a gamer who loves 'first person shooter' games on Playstation, as well as any version of, Mario! 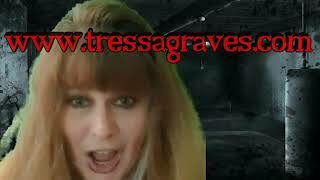 To ask Tressa Graves questions, please sign up.